Construction of the DEEPWATER began in 1953 in a horse pasture beside the home of John and Alma Wilson on Etheridge Road on the North End of Roanoke Island. John Wilson, Jr., born in the town of Manteo in 1902, had married Alma Etheridge and they lived on land given to her by her father, Adam Etheridge. In local tradition, John became a boat captain. 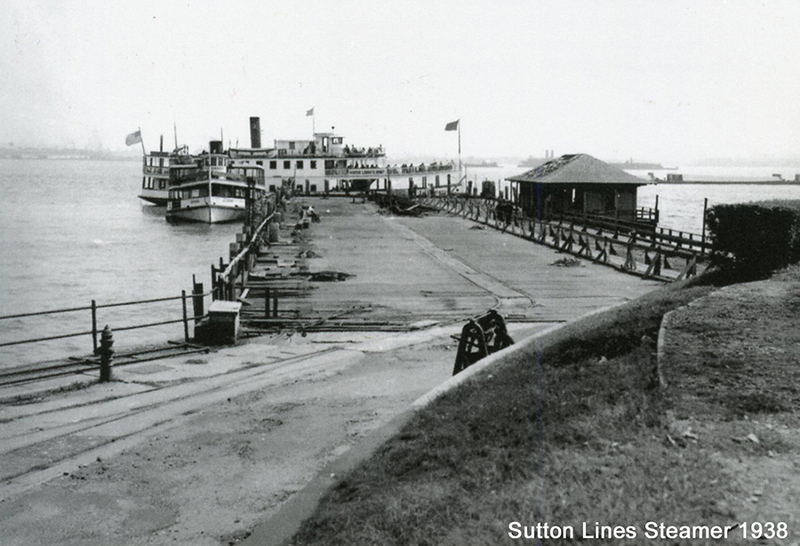 In fact, during the 1930s, John was captain of a Sutton Lines steamer that carried passengers on excursions from the Battery to the Statue of Liberty and from New York City up the Hudson River to Bear Mountain Lodge. When John returned home to his family, he wanted to build a boat for family picnics and excursions around Roanoke Island. His years of experience with boats now combined with skills he had learned from his father made this possible. John Wilson, Sr. was a master carpenter who moved his family to Manteo from Hatteras Island after two “back to back” storms in August of 1899. 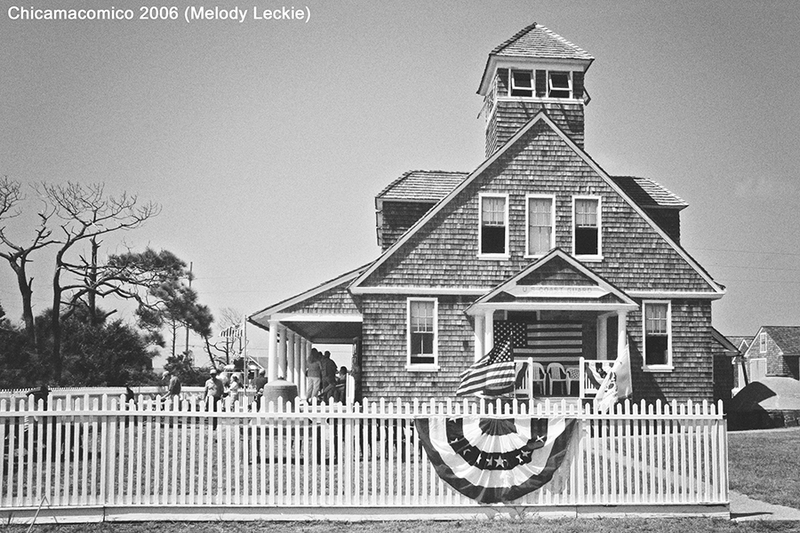 The storms had washed many houses off their foundations in Rodanthe, Waves, and Salvo. 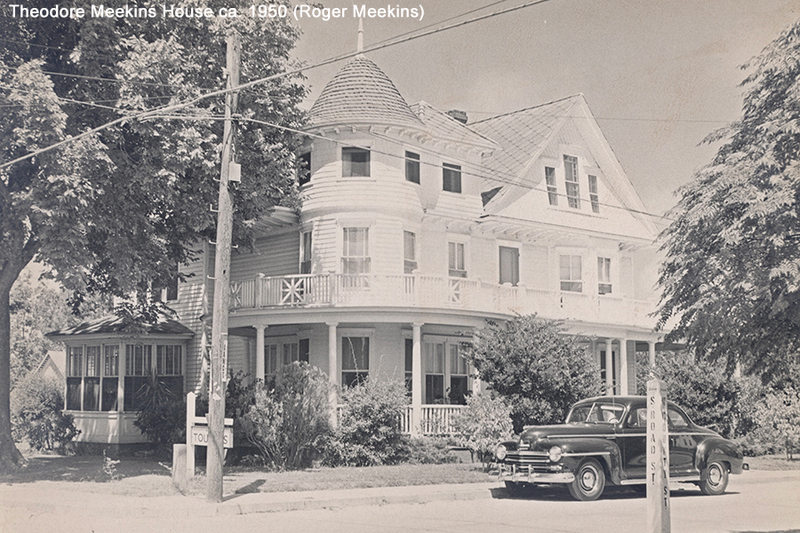 The senior Wilson went on to build several United States Life-Saving Stations along the Outer Banks including Chicamacomico, and several houses in Manteo including the Theodore Meekins House (now The White Doe Inn) and the Carson W. Davis House. Having grown up helping his father, the junior Wilson was also an accomplished builder. The juniper for the boat came from M. R. White Lumber Company in Camden County. Moses White took Wilson into the Dismal Swamp to find the perfect juniper tree for the keel. White squared it and delivered it to the North End along with other juniper lumber for framing andplanking the boat. The locomotive White used to run his sawmill is preserved and located at Dismal Swamp State Park Visitor Center. The design for Wilson’s picnic boat shows the northern influences he must have observed in and around New York Harbor - as well as a bow stem he admired on a Harkers Island workboat. Never having built a boat any larger than a juniper skiff, Wilson enlisted the help of his friend and renown boat builder, Roy Etheridge, Sr. and a young man who would go on to become the "father of the Carolina Flair," Warren O'Neal. Pictured: Alma Etheridge Wilson and John Ferman Wilson. 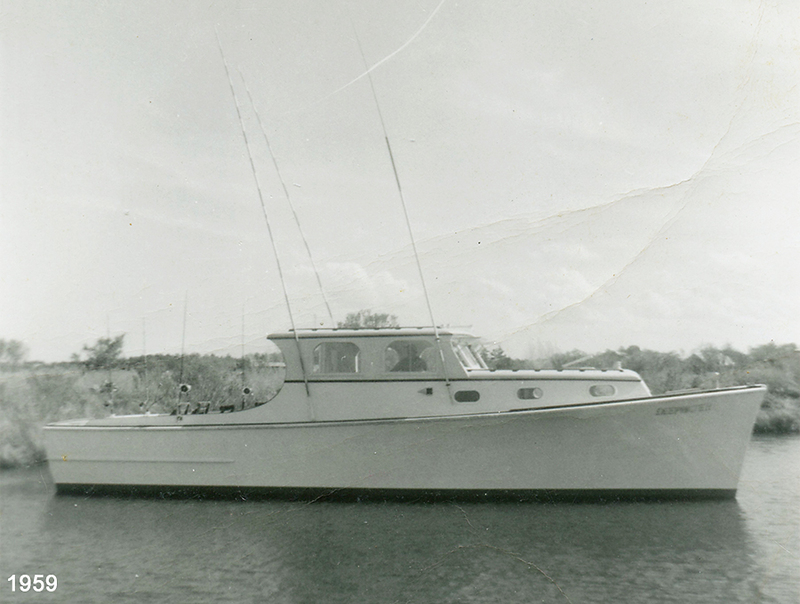 It took a couple of years to finish the boat, which was outfitted with a GM DETROIT 4-71 diesel engine. 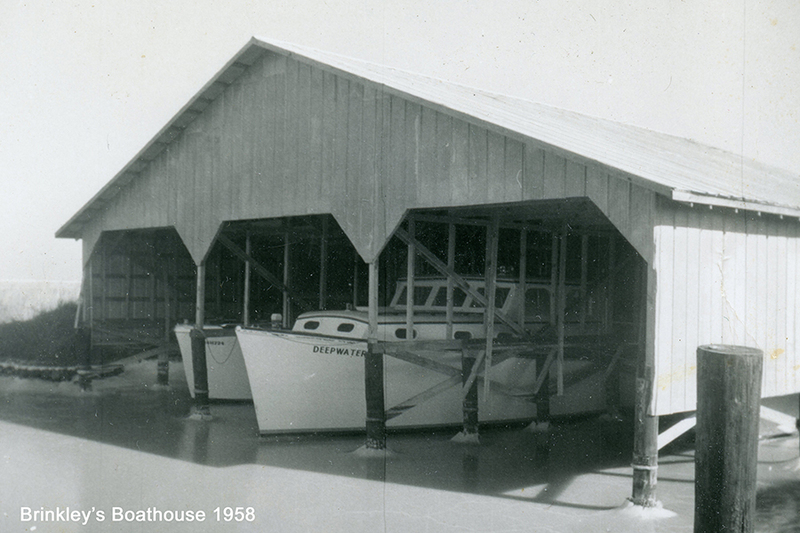 The completed DEEPWATER found her first home in Manteo at Brinkley's Boathouse, located where Marshes Light Marina is today. With his wife, his three children, their spouses, and three of his four grandchildren, John Wilson, Jr. enjoyed regular Saturday picnic cruises around the island. The picnic was always the same: cold fried chicken, pimento and cheese sandwiches on white bread with the crust cut off, potato salad and deviled eggs, followed by Alma Etheridge Wilson's well-known multi-layered chocolate cake. There was always plenty of sweet iced tea and Vienna Fingers on board. By 1959 John wanted a smaller, faster boat. 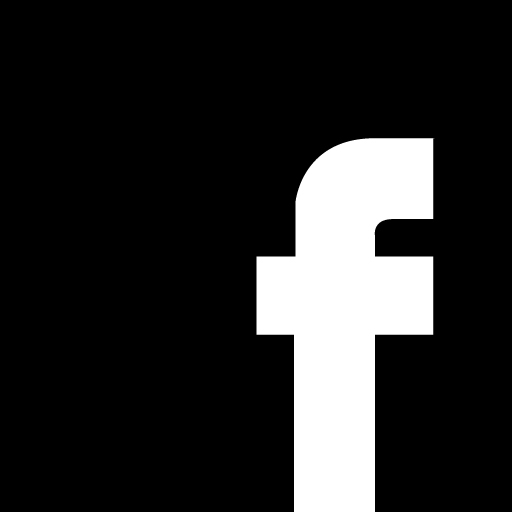 His daughter-in-law's father, Delton Ivey Dowdy, had recently retired from a long career in the U.S. Coast Guard and had been running a private boat, the CONNIE DIONE, for the John Wood family. 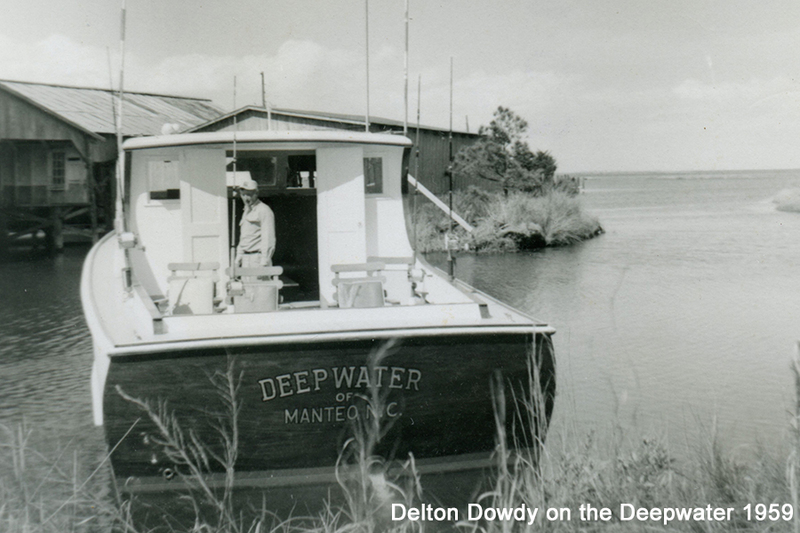 Born in 1904 in the village of Otila (now a part of Kitty Hawk), Delton Dowdy was looking for something more to do. His sister's husband, Herbert Perry, one of the first captains on the Outer Banks to take fishing parties out on his workboat, the MILDRED I, suggested he would enjoy seasonal charter fishing. Dowdy approached Wilson about buying the DEEPWATER. They agreed on a price of $6,000.00 and the DEEPWATER made her way to Perry's dock in Kitty Hawk where boatbuilder Allen Hayman added the flybridge and made her ready for sport fishing. 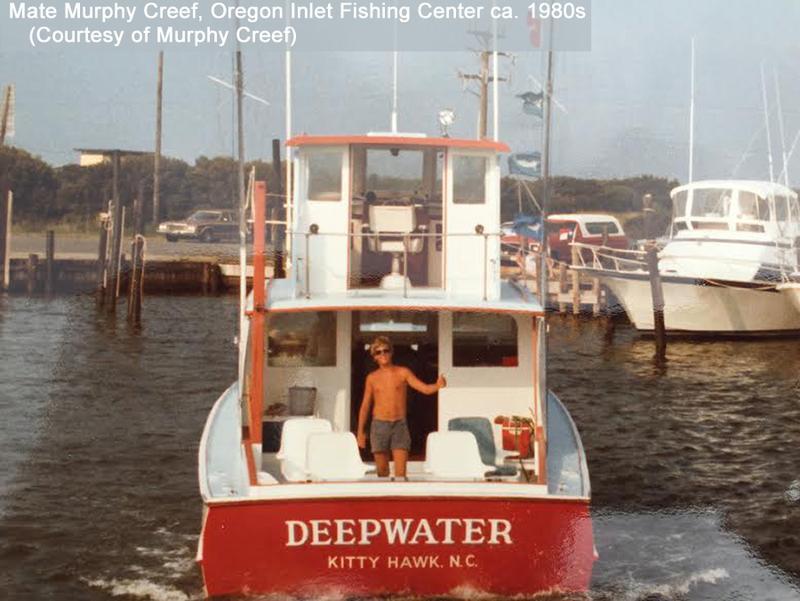 For many years the DEEPWATER made her winter home in Dykster's Ditch, and spent summers at the newly opened Oregon Inlet Fishing Center, owned by H.A. Creef. Captain Dowdy did indeed enjoy sport fishing. His mate was his nephew, Herbert's son, Carlis Lee Perry. They fished together for a few seasons until Dowdy bought himself another boat for inlet fishing and Lee Perry became the captain of the DEEPWATER, taking fishing parties offshore. In 1966 Dowdy sold the DEEPWATER to Lee Perry, who continued to fish the DEEPWATER for 25 more years. 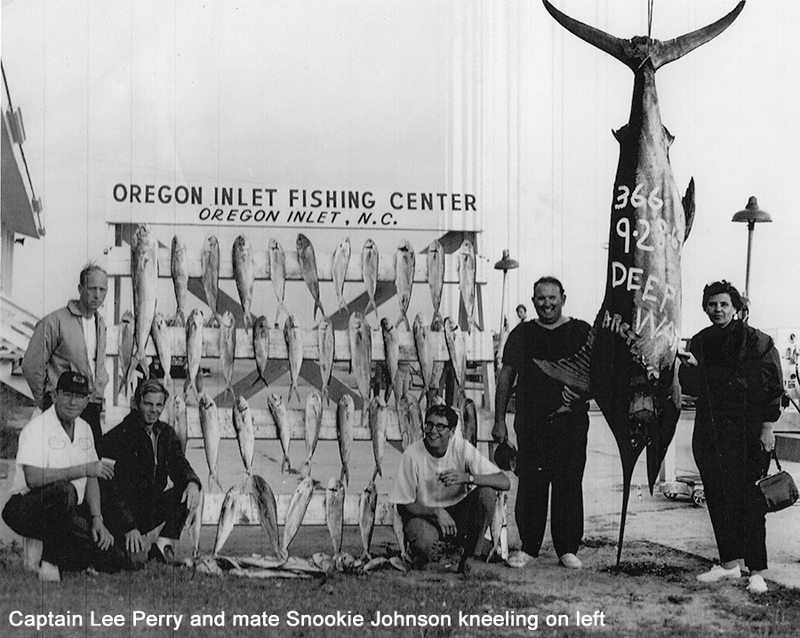 With Captain Perry at the helm, the DEEPWATER had a long, distinguished and memorable life at Oregon Inlet. The local fishing term “soda crackers on the bridge” originates with Captain Lee. Many mates worked for Perry over the years. If a game fish was caught, Lee would say it was because of the bait. If a marlin was lost, it was always the mate’s fault. Lee would fire them right then and there. Some mates were fired twice in the same day. Despite multiple firings both Snookie Johnson and Murphy Creef spent many summers on the DEEPWATER. After Captain Perry's death the DEEPWATER, too old, too slow, and completely outdated, was sold in 1991 to Captain Buddy Cannady and his stepson Captain Bobby Croswait. They were building a modern sport fishing boat and bought her for the engine. The builder’s grandson, John Wilson IV, bought the old boat without engine from Croswait for $5,000.00. 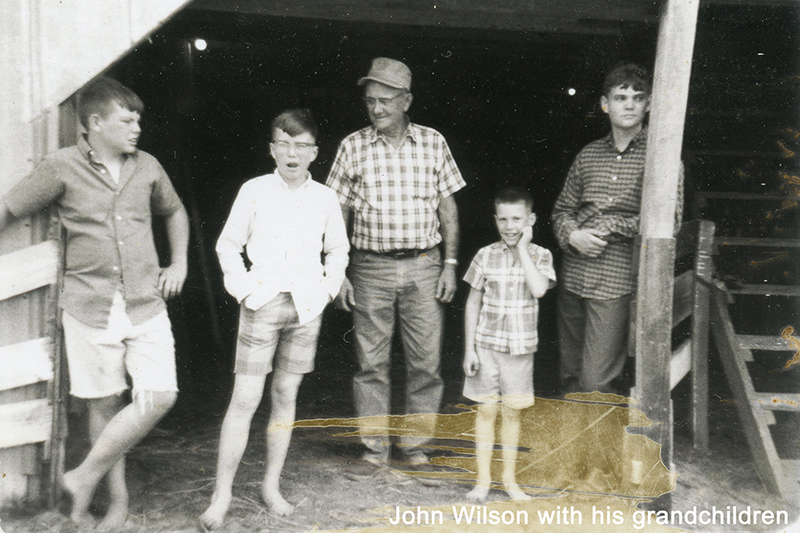 The younger Wilson and his father, Jack Wilson (John III), hired Calvin Gibbs Construction to build a barn for the boat back in the same pasture where she was originally constructed some 38 years before. Lish Meekins from Wanchese moved the boat into the barn (pictured below in new barn). After 22 years, John and his partner William Parker decided it was time to restore the old picnic boat for excursions around the Island. There were plenty of excellent boat builders on the island, but who would be interested in restoring an old, outdated wooden boat? The answer came in the fall of 2013, while having lunch at Annie’s Great Gut Deli at Thicket Lump Marina. Wade Davis asked about the old wooden boat. Fate had decided the DEEPWATER spent 22 years in a barn waiting for Wade Davis. Lish Meekins and his son Luke moved her from the North End barn to Wanchese where restoration began in the original Buddy Davis Boatworks building in November, 2013. Wade is a pedigreed Roanoke Island boat builder. In the 18th century, his Etheridge and Scarborough ancestors built workboats and schooners. 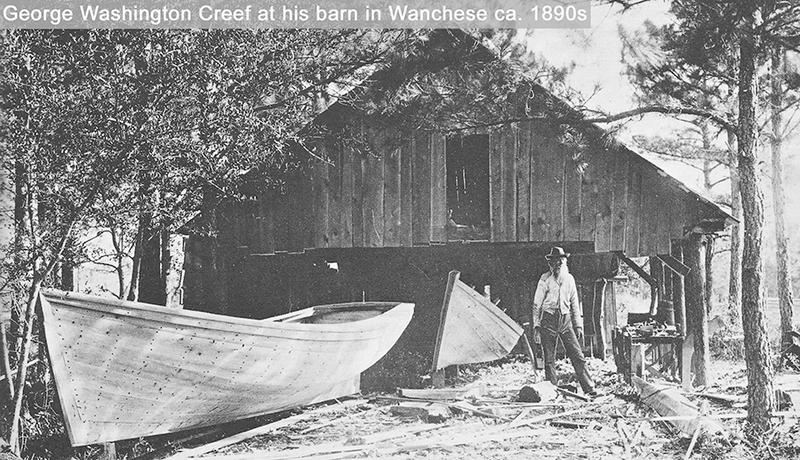 His great-great-great grandfather George Washington Creef designed and built the first Roanoke Island shadboat in the late 19th century. 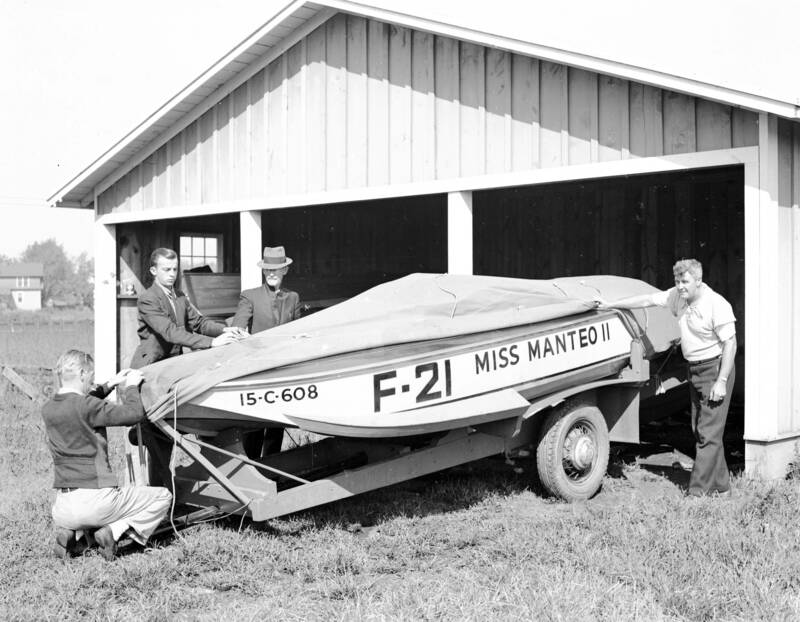 In the early and mid 20th century, Wade’s grandfather and grandfather’s brother designed and built race boats that won national titles. 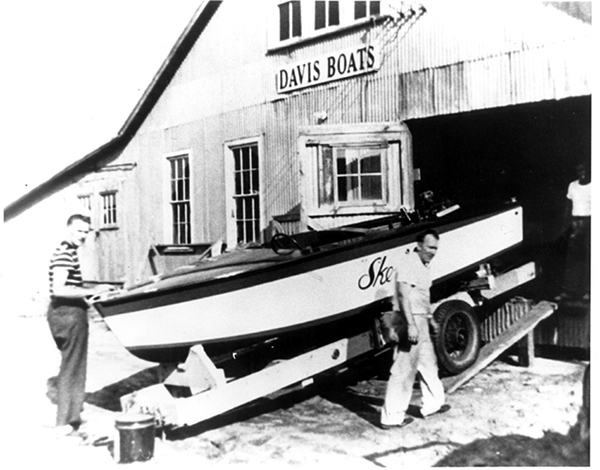 His father, Buddy Davis, a legendary boatbuilder created boats using wood, molded fiberglass, and cold-molding glass-over-wood techniques, spanning the technological ranges from scarfing planks, to building a hull upside-down on a jig—a first, at the time—to molding fiberglass with advanced methods like resin-infusion. There are hundreds of Buddy Davis Yachts around the world. 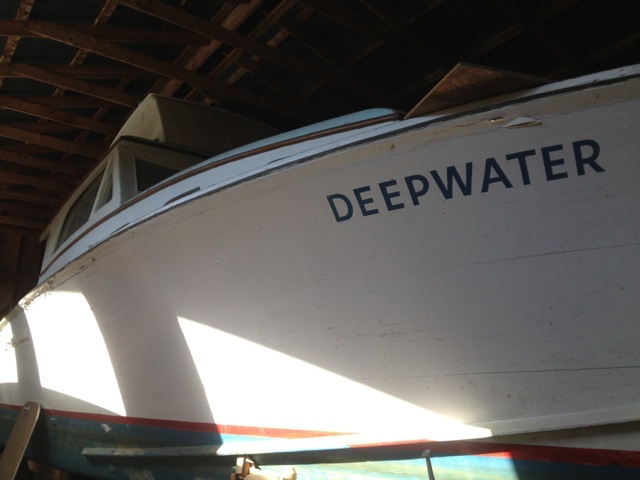 Should the DEEPWATER be restored as a picnic boat or a sport fishing boat? It had served as both. The original builder’s family helped decide. Son Jack and grandsons Ephey Priest, the captain of a research vessel for Florida State University, and Nelva Capps, a respected sport fishing boat designer and builder at Capps Boatworks in Virginia Beach guided the current owners to decide to restore the DEEPWATER to its picnic boat origins but with its 1960 flybridge reconstructed. 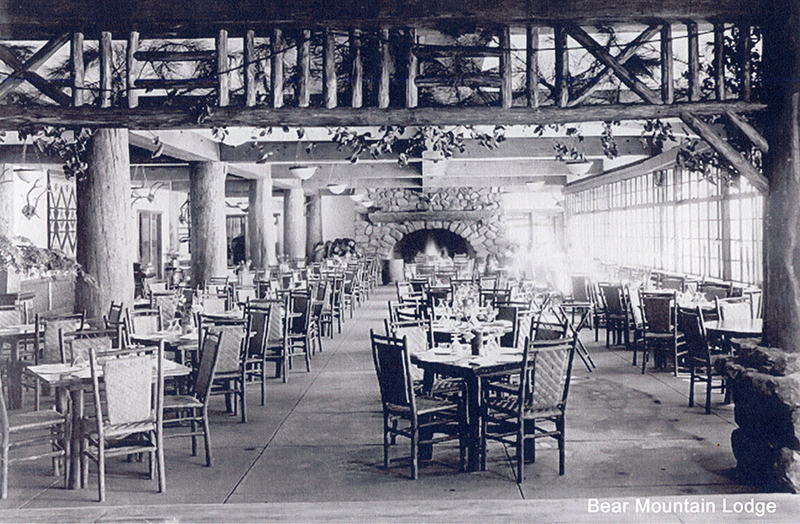 Wade Davis along with master builders Davis Pearce and Roger Ark worked on the restoration for 21 months. With an original door as a pattern, James Powell reconstructed the mahogany doors. Artist and brightwood finisher, Rosanna Gusler, did the masterful job on all the exposed wood on the boat. The DEEPWATER, after 24 years on land, re-entered the water at Wanchese on August 20, 2015. 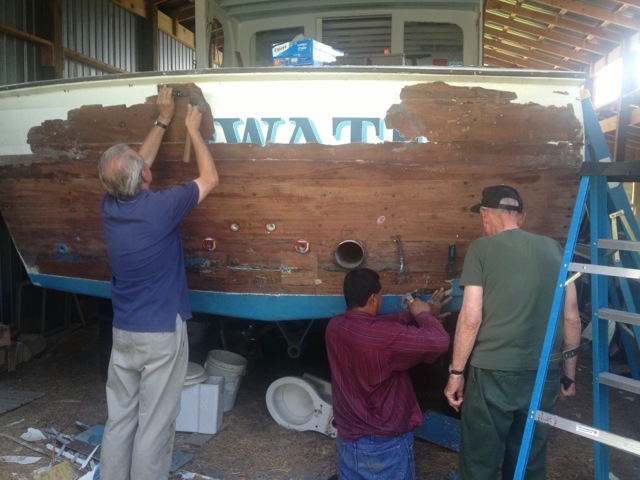 Dennis Denzin, Patrick Pritchard, and Manuel Ramirez spent many months working on the boat. Photographed weekly by Davey Jones and regularly by Melody Leckie, DEEPWATER’s restoration has been well documented.